Oh joy! I have horsetail! Gardening is full of challenges. Once you get one thing under control, another challenge presents itself. It can be super frustrating at times. After getting a decent handle on the English Ivy in our yard, I have discovered that we have horsetail weeds. I had heard about the weed but never encountered it in any of my previous yards. You would think, oh- no biggie, just pull them! It’s not really that simple with horsetail actually. Horsetail is a prehistoric weed with one of the toughest root systems around. It has a rhizome system which responds to pulling or digging by sending out even more. I have read that the root system can be anywhere to 7-40 feet deep! I lean toward the organic spectrum of gardening and avoid using chemicals in our yard. I was willing to at least entertain using something on the horsetail but it is completely futile. 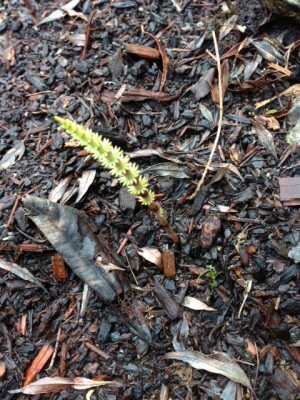 Nothing can break through to eradicate horsetail, which is explains why it is one of our prehistoric plants. So I have decided to just snip them off at the soil surface whenever I see them. I am not sure if I can kill them by robbing them of photosynthesis but I am willing to try. The other part of the plan is just to increase competition by planting lots of perennials and other plants to crowd the horsetail out. After reading about this, it sounds like it can take 5 years to get horsetail under *some* control. I am trying to keep a positive outlook, it’s not a terribly ugly weed but I certainly don’t want to see it take over my garden. I plan on sticking with daily weeding and snipping. It’s fun to get out and wander the gardens anyhow. Do any of you have any advice for dealing with horsetail?